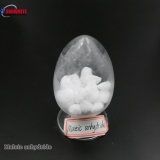 China Maleic anhydride Suppliers, China Maleic anhydride Manufacturers. Maleic anhydride: A colorless crystalline powder with a strong pungent odor, first obtained in 1834 by malic acid. Maleic acid is obtained by catalytic oxidation of benzene or air oxidation of butene or butane, soluble in ethanol, ether and acetone, insoluble in petroleum ether and carbon tetrachloride, and formed by hot water.